Although not officially recognized as a station on the BNSF Stockton Subdivision, Bay Point (formerly West Pittsburg) is nonetheless of interest from a railfan perspective. Two locations  McAvoy Harbor and General Chemical  offer good venues for catching the action on the tracks. General Chemical is your best bet for photos, as there are places to pull off the road so you can get a look at the three rail lines that literally crisscross each other through the area. BNSF takes the high road, with a small steel girder bridge that spans the former Southern Pacific's Mococo line. 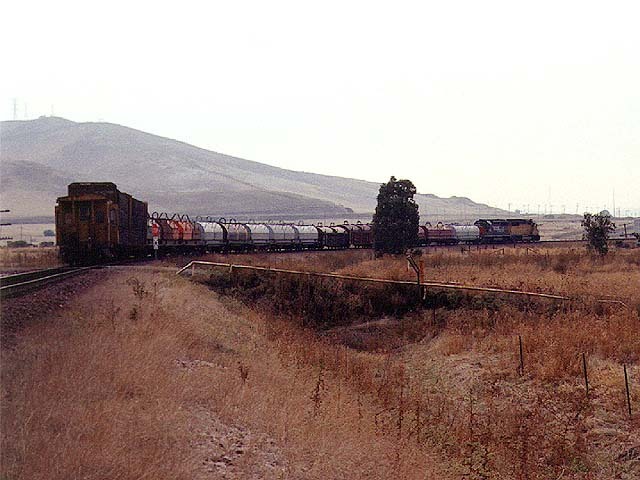 The Union Pacific's original tracks leading to Port Chicago also run along this route. If you are following the line to the west, this is the last place for several miles that is accessible to the general public. Once the tracks cross the steel bridge at Nichols Road, they enter the Concord Naval Weapons Station and disappear around the bend of a hill. 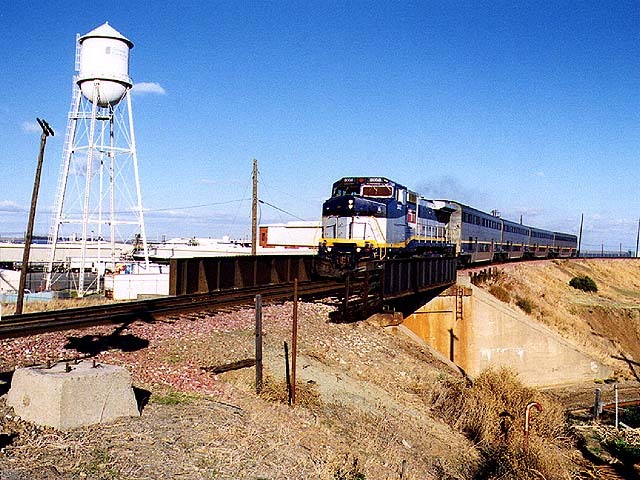 Amtrak 2052 heads over the plate girder bridge at Milepost 1160.5 with a westbound San Joaquin in tow in November 1998. The bridge crosses the former Southern Pacific tracks of the famed Mococo line. Union Pacific's severed Port Chicago Industrial Lead is also nearby. Photo by Roni Gehlke. Looking west from the steel bridge at the crossing into the General Chemical plant, we see the tail end of the Union Pacific Steel Train as it snakes its way toward Port Chicago in November 1998. About three miles west of here, where this train is headed, the UP's Port Chicago lead splits off from the BNSF main. This is one of the few UP trains that venture onto the BNSF tracks through this area. Photo by Roni Gehlke. 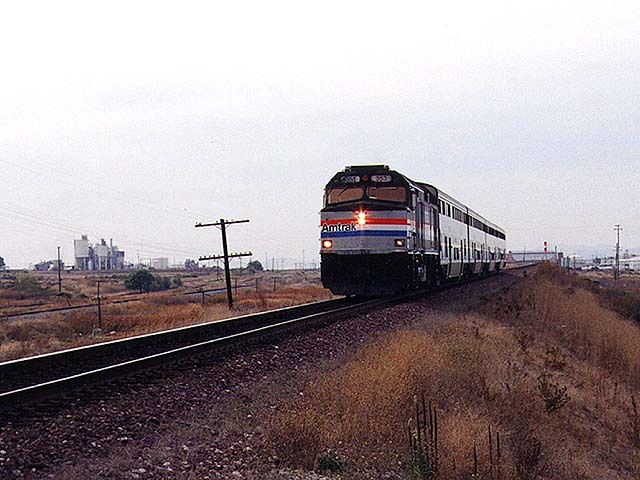 An aging F40PH is on the point of Amtrak San Joaquin Train 716 as it approaches us heading east in November 1998. Here you can also see two center beam flatcars sitting on the UP Port Chicago lead if you look to the left of the photo. You can easily recognize our attempt to disguise the otherwise hazy sky, which we made a cloudy blue in Photoshop. Photo by Roni Gehlke. About a half mile east of General Chemical there is a small access road  River Sands Road  that crosses the tracks. 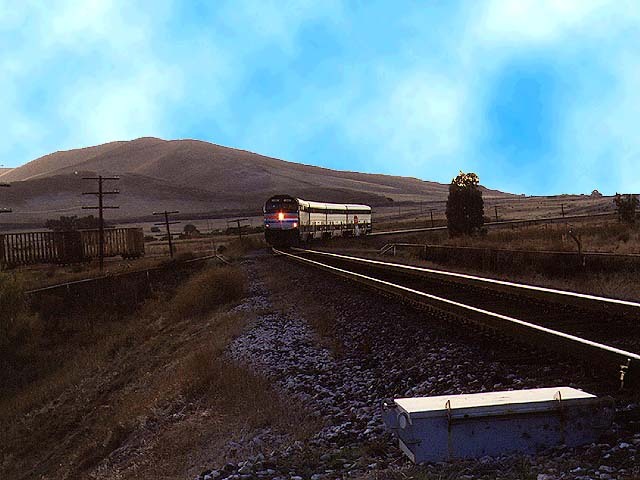 It was from the opposite side that we were able to catch AMTK 353 in November 1998 as it sped eastward. Photo by Roni Gehlke. Another shot of AMTK 353, this time illustrating the desolation that makes up this section of Contra Costa County. General Chemical's water tower and the steel bridge are visible in the distance. Photo by Roni Gehlke. This page was last updated Tuesday, Aug. 3, 1999 at 23:55 hrs.